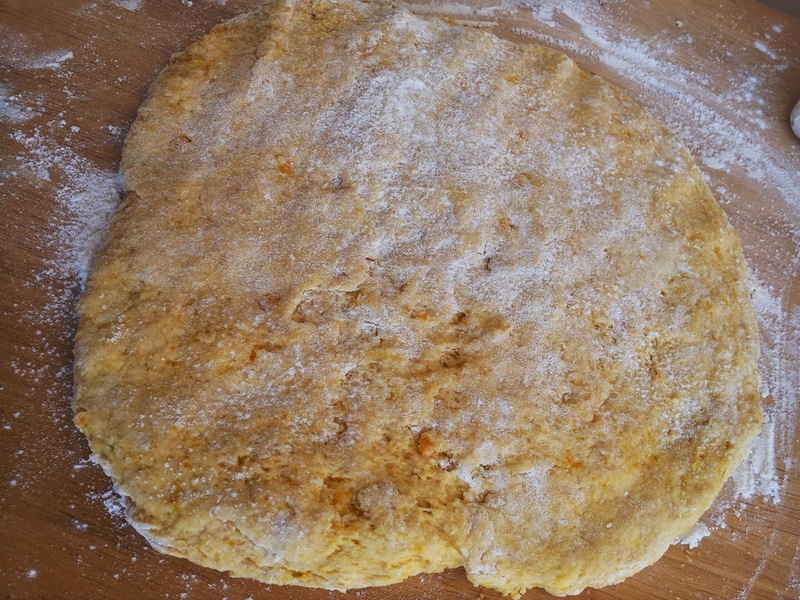 During this pumpkin time of year I like to make Granny Browne's Pumpkin Scones. Those lucky enough to be offered one of these scones will wonder at the unusual colour and light texture, and never guess that they contain a vegetable. This recipe comes out of "The Cooks Garden" - a kiwi book for cooks who garden and gardeners who cook. It was written by three southern gardening and cooking sisters Helen Leach, Mary Browne and Nancy Tichborne "The Cook's Garden" was a popular cookbook in the 1980's, when I was a young mum ... and along with the Moosewood cookbook, it was one of the most used books in the kitchen. All the women in my family had a copy, not only for the recipes but for the gardening and harvesting information. 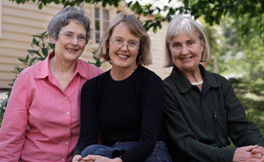 Three talented sisters: left Helen, centre Nancy, and right Mary. I have tried many recipes from the book, and all are good family food. The layout of one vegetable or fruit per chapter gives a variety of ideas for vegetables in season or in plenty. 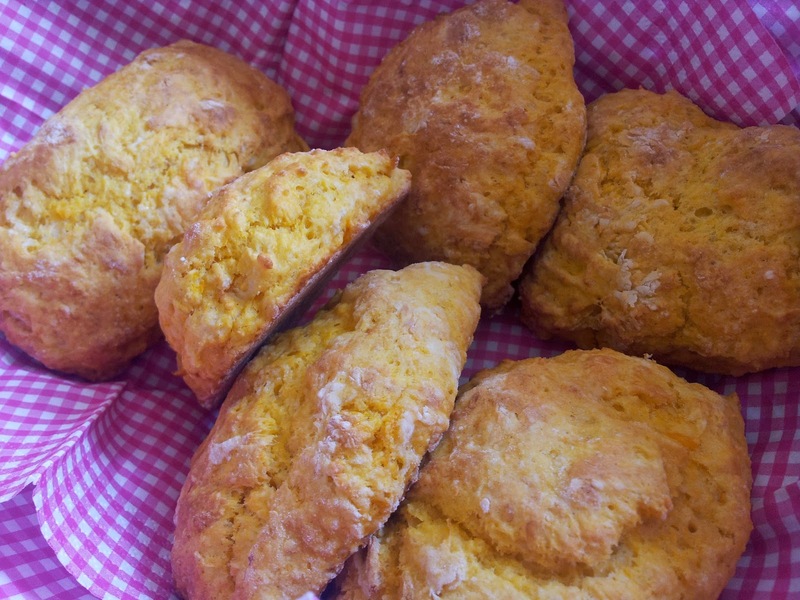 They generously share family recipes, like the pumpkin scones from Granny Browne. It's out of print now but keep an eye out for it in second hand book shops or perhaps you'll find it on the shelves at your local library. Start by preparing the pumpkin puree. 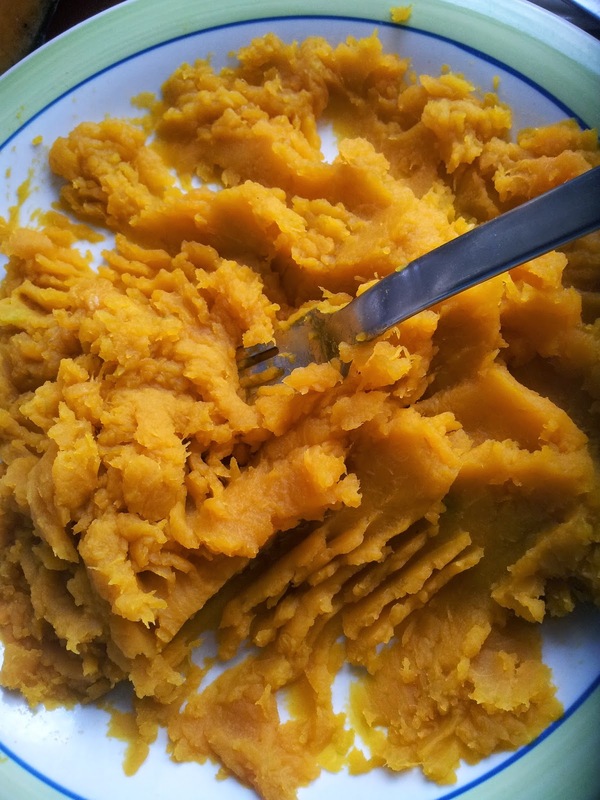 Cut up enough pumpkin that will make a cup of puree, cover with water and boil until soft. Drain and cool and mash with a fork or potato masher. (I usually make double and freeze the other half for a future batch of scones. 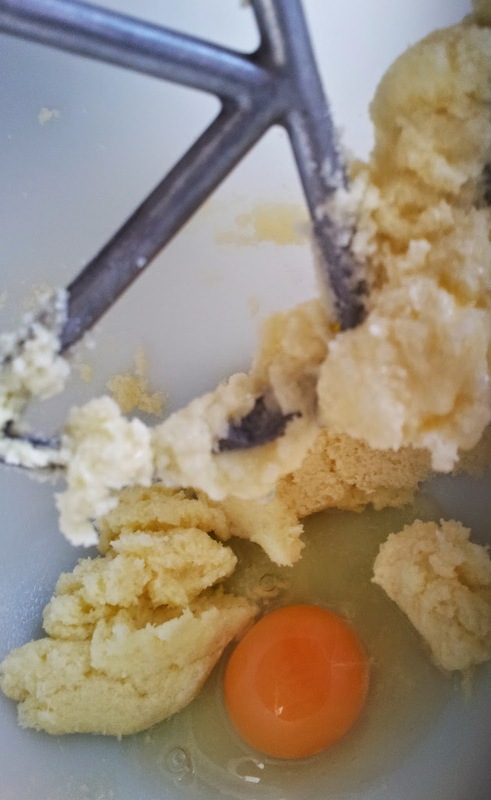 Soften the butter and cream the butter and sugar until pale and the sugar has dissolved either by hand or mixer. Then add egg and beat again. Add the pureed pumpkin and beat again. it will be softer than usual scone doughs. Avoid over working your mix to ensure your scones will be light. 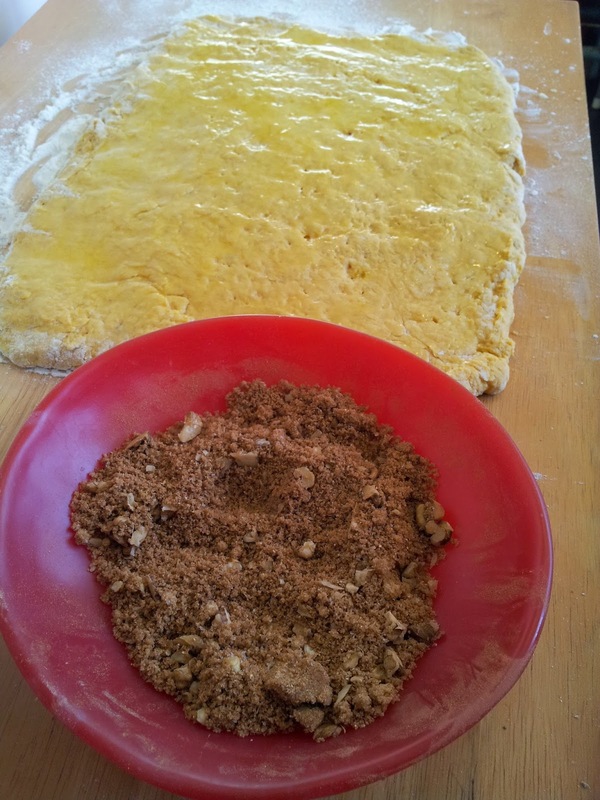 Tip out onto floured surface, sprinkle flour on top to avoid sticking to rolling pin and hands. Gently shape and roll out to about 3-4 cm. Cut into whatever size scones you want. You could make the dough into a circle and cut them into wedges. I cut mine into 16 pieces and cooked them on baking paper sprinkled with flour at 180-200C for 10-15 minutes (it all depends on your oven - 180 for fan bake). If you can smell them they are probably ready. 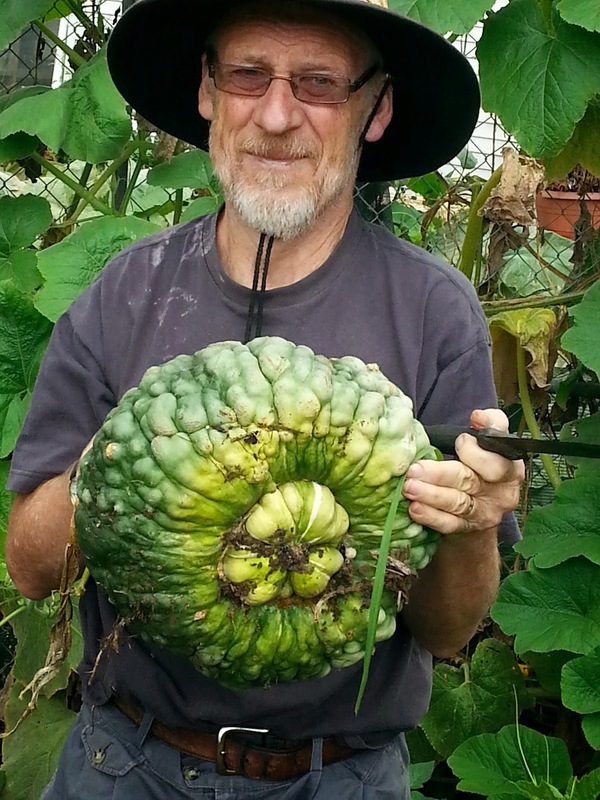 I haven't ever been that successful growing pumpkins in my garden in Dunedin. I guess I haven't given them the space or ideal growing conditions they crave. There's no shortage of space up here in Auckland at our Sanctuary Community Garden. 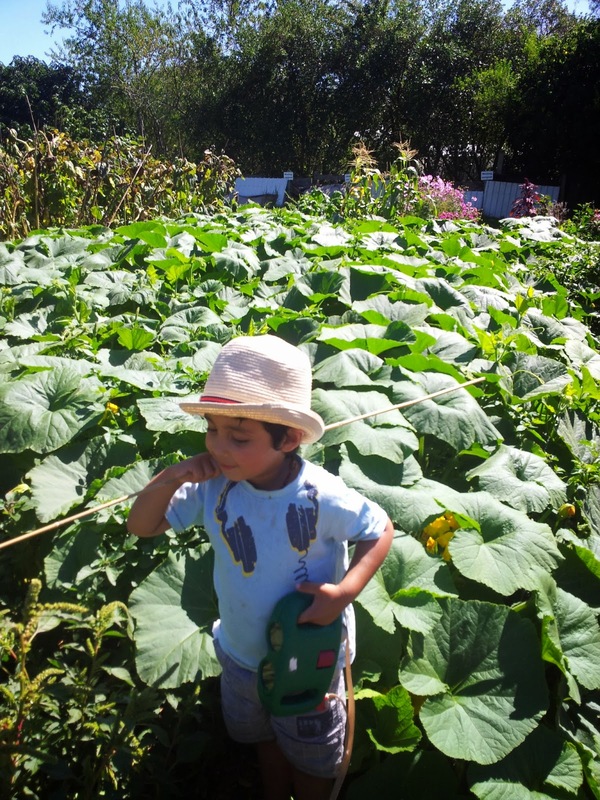 I've watched with delight as small pumpkin seedlings planted out in October grew quickly in the warm and rich organic, volcanic, Mt Albert soils. in three months after planting out as seedlings the size of my palm. At the gardens we have harvested our pumpkins. How satisfying it is to use a pumpkin that you have watched grow from a seed. Fellow gardener Liz treats her pumpkins very well. They sleep on carpet. The carpet avoids weed competition, keeps the soil moist underneath and the pumpkins dry. 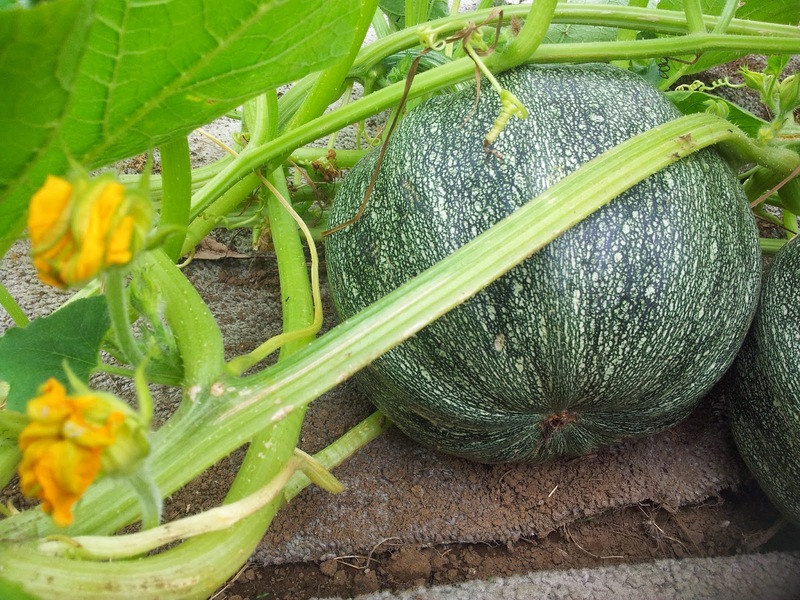 Even better, we managed to produce the winner in the Auckland Community Gardens pumpkin growing competition. I loosely use "we" - the win was really down to the effort and diligence of one of our gardeners, Trevor. The pumpkin is an Italian heritage variety called Marina di Chioggia (sea pumpkin) and originates from the seaside village of Chioggia near Venice on the Adriatic coast of Italy. How appropriate we grow them here in Auckland, the City of Sails. It's not the most attractive pumpkin I've seen with its lumpy wart-like skin but Trevor assures me that this variety will be delicious eating. The opportunity for me to preview this sea pumpkin came when Trevor found one that wouldn't store for long - it began to soften at the top. Usually these pumpkins if stored under the right cool and dry conditions can keep for six months. 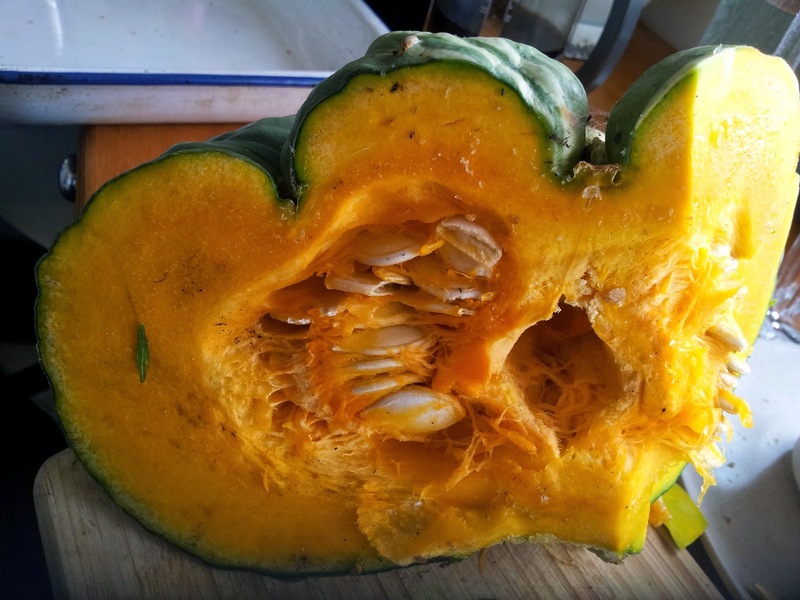 Well, it's not the best pumpkin for roasting (a little too dry) but it's good for soup and as you can read on the blog Boldos Thoughts on Food it's excellent for pumpkin gnocchi. 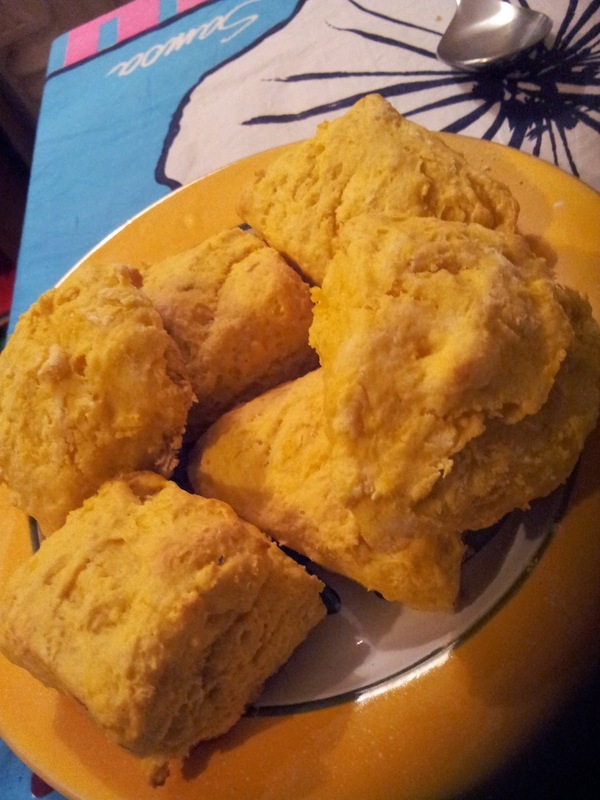 Likewise a dryer puree and its dense gold colour works well in the pumpkin scones. If pumpkin is used in a sweet recipe it usually is laced with spices. I had an idea - it's time to experiment with Granny's recipe. 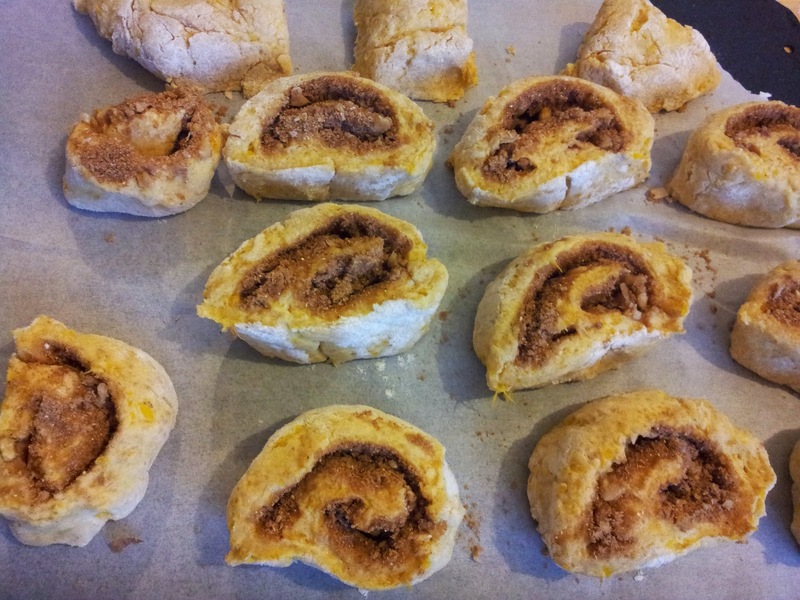 The warming spices used in an American pumpkin pie or pumpkin bread could have been added to the scone mix but I wanted a greater hit of spice in each bite so I decided on spiced pinwheel scones. For the spices I searched for a combination of spices used in pumpkin pie. 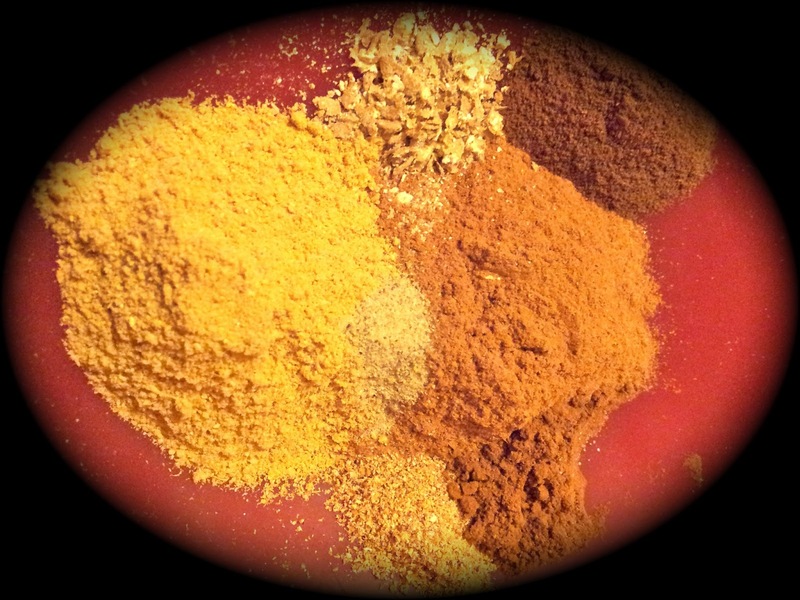 Use spices that are as fresh as possible... and it pays to grind as many as you can from the seed, to get the greatest punch. 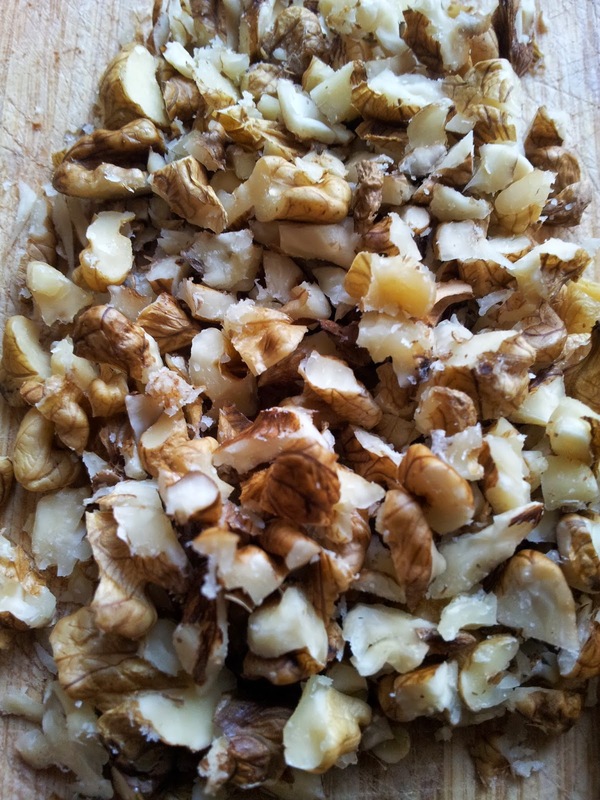 I grated the nutmeg, whole cardamon and coriander. Another deviation...I added a pinch of white pepper for a little heat and to remind me of my favourite Dutch biscuits Speculaas. And a large pinch of ground white pepper. Use the scone mix as above and try to achieve a firmer dough by reducing the amount of milk to enable you to more easily roll the scone mix. My first attempt was too soft and it was really difficult to role and produce the pinwheels. Their great taste encouraged me to try again with a slightly firmer mix. 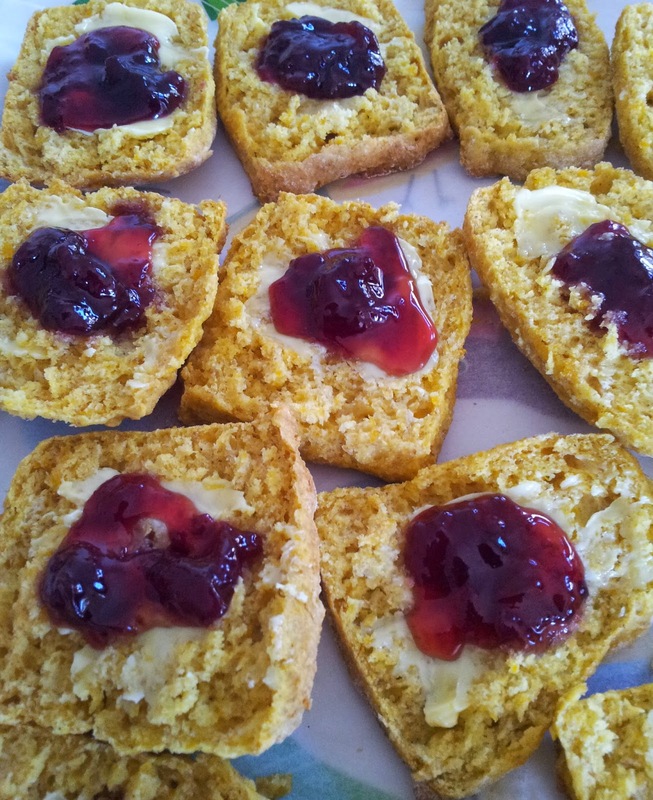 The plain scones you should keep a softer mix as a wetter mix helps to keep them moist and light. 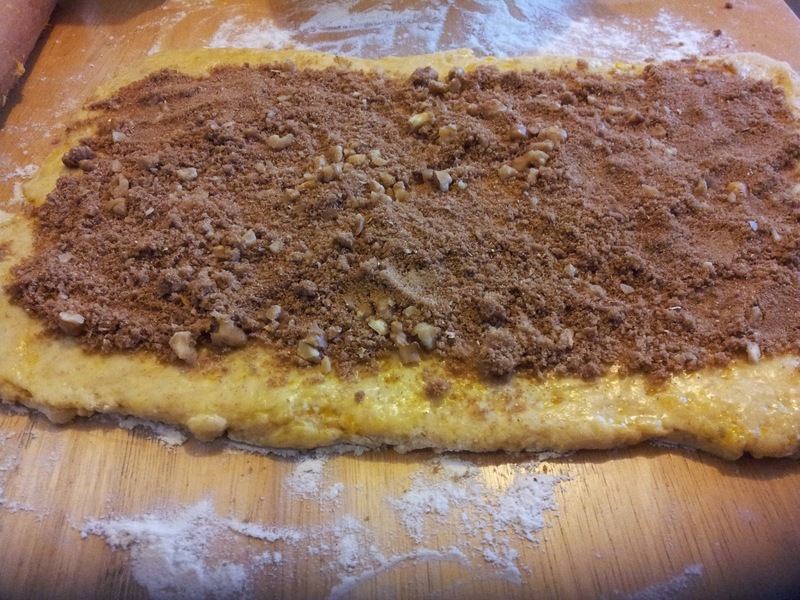 To 1/2 cup of brown sugar, some chopped walnuts (optional), a pinch of salt and 1 Tbsp of the spice mix. Melt 50 gms of butter and brush generously over dough that has been rolled out to about 2 cm thick and follow up with the spice mix. You can brush butter to the edge but leave at least a cm around the edge free of the spice mix. 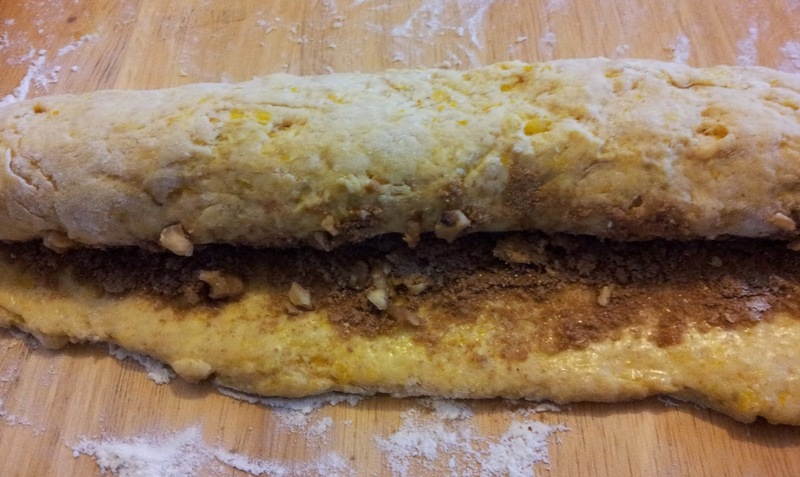 Pat down gently to stick the spice to the dough and then gently roll the long side. 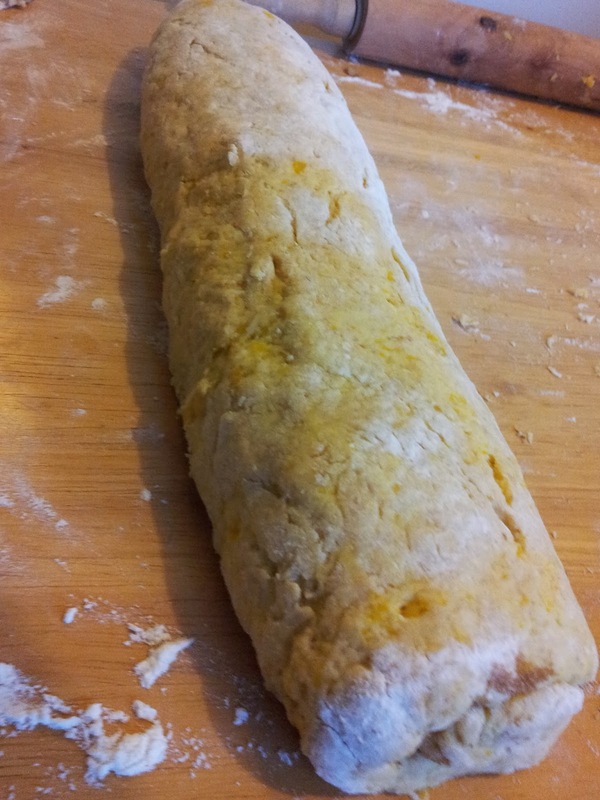 When you get to the end of the rolling, roll over and gently press down to seal the base. 3 year old Beau who wouldn't like the spice hit. Cut into 3 cm slices and place on a cold tray covered with baking paper. Cook 180 for 10-15 minutes. I had just started writing my blog when I met Helen Leach of "The Cook's Garden". Helen is an anthropologist focusing on the social history of food preparation and recipes. I asked her about recipe copyright issues I might encounter writing a blog. She said the wonderful thing about recipes is that no one truly owns them because they have been handed down from generation to generation and are constantly evolving. Helen believes it's important to have someone in the family to look after family recipes and it's important to note who made modifications to recipes. 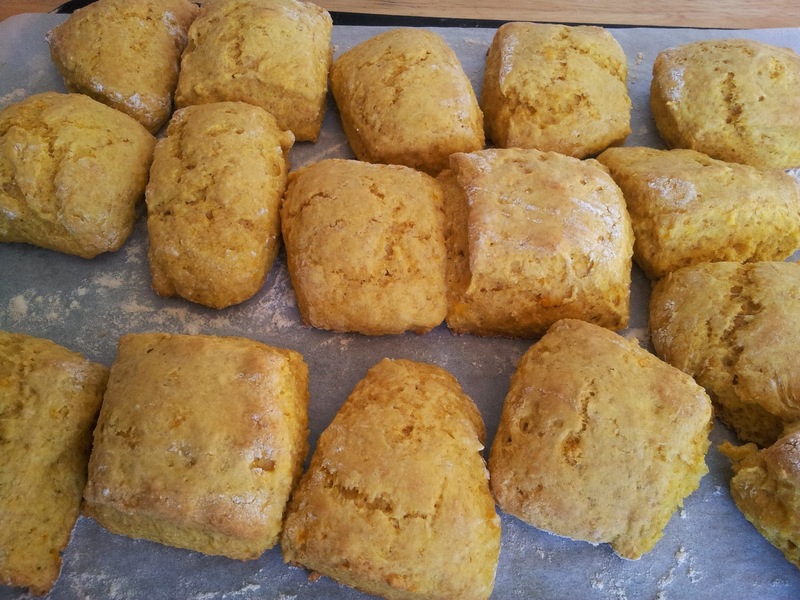 It's thanks to Helen and her sisters that I discovered Granny's Browne's Pumpkin Scones and I in turn have offered you another option with my experimental Spiced Pumpkin Pinwheel Scones. One of the most exciting things about recipes is that they are constantly evolving.